In a Socratic seminar, Socratic circle, fishbowl, or Harkness discussion, the primary goal is for students to engage in and sustain an academic discussion independent of the teacher. The benefits of student-led discussions are well documented—students learn to purposefully reference the text as evidence as they develop opinions, and they learn to be more receptive to and respectful of the ideas of others. Ultimately, student-led discussions require students to actively engage in collaborative and respectful dialogue while utilizing feedback from their peers to gain additional insight. It may seem puzzling that students often fail to transfer the behaviors they practice in such discussions to ones facilitated by the teacher. How do we, as educators, make the most of what the Socratic methodology has to offer while overcoming some of the common problems that inhibit students from transferring these skills to whole class discussions and beyond? While they have many benefits, student-led discussions often create unintended consequences that inhibit their effectiveness. Fortunately, there are solutions that can enable students to take ownership of academic conversations and facilitate discussions across classroom settings. Problem: Uneven level of engagement. In a student-led discussion, teachers generally divide the class in two, which in an average-size classroom results in 10 to 15 students per group. As such, it is inevitable that some students will be more intellectually engaged and will speak more than others. Solution: Use smaller groups to increase engagement. Instead of two groups, break the students into three or four smaller ones, increasing the intellectual “surface area” and the expectation and accountability for active engagement from each individual. Problem: Assessment difficulties. The typical grading criteria value the frequency of comments along with overt references to the text, requiring the teacher to furiously take notes in an often quixotic attempt to make an accurate assessment of the quantity and quality of student comments. These grading criteria also tend to inhibit the natural flow of conversation, resulting more in a series of independent comments rather than dialogue, as students vie for a particular grade. Solution: Try redefining the success criteria. You may be better able to assess student-led discussions by collecting evidence of preparation for the seminar as well as conducting a post-discussion reflection. The success criteria then are redefined as responsive listening, thoughtful contributions, and reflective thinking. This has the additional benefit of freeing up the teacher to circulate, gather data on collective student insights, and evaluate the relative strengths and areas in need of improvement in the design of that specific discussion assignment. Problem: Uneven playing field. Students typically aren’t taught how to engage in an academic discussion, so these discussions tend to work to the benefit of students who are already able to participate well. Students require quality instruction and feedback in order to improve their ability to productively participate just as they need to be taught to divide fractions or find the atomic mass of an element. This holds true for the more reticent students—and the constant contributors who would benefit from learning active listening strategies. Teachers need to build students’ capacity to think before they speak, to effectively paraphrase, to honor others’ thoughts while communicating their own, to ask thoughtful follow-up questions, and to synthesize ideas coherently. Problem: Failure to transfer. A crucial missed opportunity with student-led discussions is the failure to transfer student ownership to everyday classroom discussions. When students aren’t organized into these formalized groups, they often automatically fall back into filtering their questions and comments through the teacher, and the teacher may resume the role of primary facilitator, with the verbally confident students dominating the conversation. Therefore, teachers need to continually prompt students to utilize the skills and the language they develop as a result of participating in these student-led discussions, so they transfer these skills to other classroom experiences. For example, during a whole class discussion, students should be expected to bounce ideas off of their peers’ comments, paraphrase and extend the conversation, and, through inquiry, sharpen and deepen the points being raised—all without the teacher serving as the intermediary. As such, it is imperative that these conversational moves be taught and reinforced consistently across instructional platforms so the way students dialogue in the more formalized student-led discussions is also the expectation and reality for all classroom conversations. 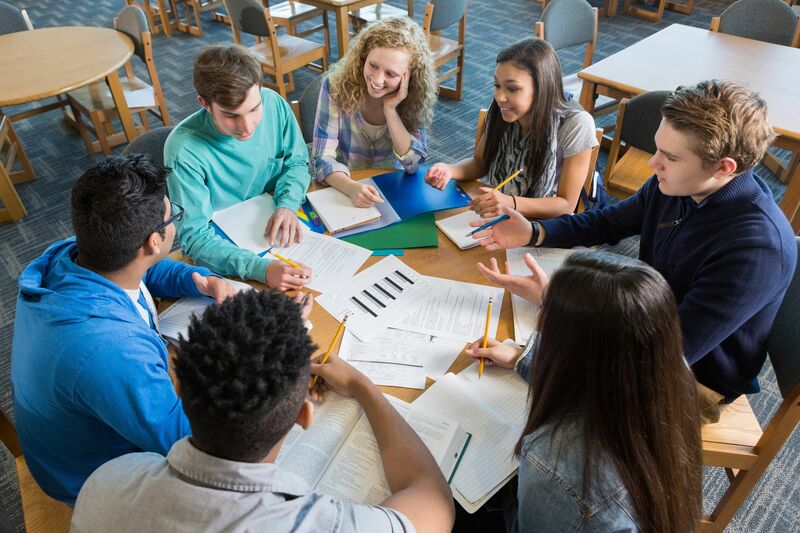 The various iterations of student-led discussions are powerful strategies for increasing student participation, intellectual investment, and inclusion in all academic discussions. Our lesson designs and assessments must support our primary goal: that these discussions lead students to increased autonomy in sustaining classroom conversations as part of everyday practice so that they can leverage these skills and dispositions to become actively engaged and productive participants in our national civic discourse.